Knot A Care: Private Beach Front Community, Lake Front Home, Just Steps to The Beach Featuring A Splash Pool! I would recommend the apolo home and beach reunions to anyone. I traveled with a high school senior class and used this rental. It was perfect in every way. Any requests we had were accomodated and most importantly, our bus broke down the morning we were to check out and Beach Reunion and our homes owner were so accomodating and helpful as our departure was pushed back 10 hours. I plan to bring my family to this home next year (2013). Great location and great service!! I will definitely be renting from Beach Reunion on my next trip up to Destin! We have twice previously sojourned in Miramar Beach for a winter month and our stay at Casa de Palms, hosted by Jim Cochran and the Beach Reunion team, far surpasses our other experiences. We will be back to this house and under the exemplary care of this rental company - every year for as long as we can manage the trip from Ontario. The day would begin when the red glow of the approaching sunrise would peek between the palms outside our window. Within minutes wed be at the beach, coffee in hand, photographing yet another perfect sunrise. The day would be nearing its end as the sunset was photographed from the avalon Beach Estates beach bench. In between - great golf games at terrific courses just fifteen minutes away; shopping, shopping, shopping at many of the nearby malls; fabulous Happy Hours and seafood at Pompano Joes; miles of walks and jogs on pristine beach or beachside pathway;friendly chats with neighbours and other short-term residents. All of this was enjoyed from a mansion-like home base that was very much home to three couples for the month. We enjoyed one anothers company in the well-appointed principal rooms and could escape for quiet time to our apartments - AKa bedroom suites with private balconies. One of our housemates has ambulatory difficulties and the elevator made his stay so comfortable. Two of our group are fantastic cooks and had plenty of room and equipment for the production of fabulous meals. Our Beach Reunion at Casa de Palms was perfectly remarkable. Thank you Jim, Penny and the BR team. See you next year! Thanks for all of your help! It goes on the list as one of the nicest beach houses in which we have stayed during the past 20 years! Will definitely recommend you guys to our friends! I am not sure where to start with this review because there were so many great things about it. Our son was married on the beach, just a short 2 blocks from the Santorini. We had 24 people staying in this home. With 8 beautiful bedrooms and 8 1/2 baths there was ample space for entertaining, sleeping, and no one felt "under foot!" We held a large crawfish boil for the rehearsal dinner and easily accomodated 80 people on the brick driveway and around the pool area. The 2 dishwashers, a real luxury for that many people staying and cooking, never stopped. We also loved the keyless entry, using a code, and everyone could come and go to the beach and activities as they pleased. Its in a quiet area, but it was close to the other 5 homes that family and friends rented for the wedding weekend. You can not go wrong with the Santorini, it met all of our needs and surpassed our expectations. We thoroughly enjoyed our stay at Santorini. It was the perfect place for our group which ranged from teenagers to grandparents. The king suites were great for couples and the bunk room was perfect for the kids. The grandparents especially appreciated the downstairs suite. The well-equiped kitchen was awesome and we really enjoyed the pool with its light display and waterfalls! The beach is just a short walk and the surrounding neighborhood is a great place to walk. The staff at Beach Reunion is top notch and very helpful. We have taken several trips with large groups to other homes, but Santorini is the best we have stayed in! We hope to return asap! We stayed at the Santorini for our daughters wedding in October. The folks at Beach Reunion Group Rentals were accommodating and pleasant, and never made us feel like we were being a bother when we had questions or made a request. The decor was well ordered, and the house was super clean. Everything in the house worked as it should, and the kitchen quite large and well equipped, and had all the amenities one could want. Two ovens would have been nice, but we did just fine with the one. There was a warming drawer, but we didnt use it. The bunk-bed room was great for the guys! The unmarried groomsmen stayed in there, and it was perfect. We had the reception in the front of the house, and when we decorated it, it looked like a resort. People are still talking about how fun and beautiful our daughters wedding was. What fond memories we have! The house is located two very short blocks from the beach (about a two minute walk), and its an easy walk. The only thing that would have made it better is if it were located right on the beach. My personal favorite part about the house was the kitchen, but if you ask the kids (I use the word "kids" loosley - they are all adult kids) they will tell you that the pool and jacuzzi were the best part. We loved the house so much, we are now planning an extended family reunion there. Love, love love the Santorini!!! The Santorini was the perfect vacation getaway for our extended family of 23 (10 adults, 13 children ages 2-16). First class from top to bottom. Spacious and clean, only two blocks from a private beach and centrally located to shopping, golf and resturants. Even though the weather didnt cooperate for half of our stay, there were no complaints. Kids enjoyed the private pool & hot tub when we couldnt hit the beach. If you have to get stuck indoors on vacation, this is the place to be. The Concierge service helped us book tee times and find a couple great restaurants. I would definitely come back here and have already recommended it to my friends. This was a beautiful house, we stay here for memorial day weekend & couldnt be better.. The over look balconies was very, very nice...cool breeze!! The only miner complaint is the living room Tv did not show clearly at all, was hard to watch Tv! Golf cart was neat & came in handy for transporting our thing & my 73 year old mother who couldnt walk very far!! I must say this was our 1st stay & wont be our last..!!! Our group has travelled together for many years and this is the first house that we would rent again. I loved that each of the adult rooms was of equal size and had a private bathroom. There was plenty of room for all 10 kids and noone had to sleep on a blow up mattress or a pull out couch. We loved the golf cart for helping us lug our things to and from the beach. The rental company was curteous and responsive. We called the to ask for a broom and dust pan and they had one delivered to the house within a few hours. This home is beautifully decorated and so comfortable! This is an exceptional house with great beach access (2 minute walk) I love the 30a area for its character and peaceful surroundings, yet shopping and restaurants are just a few minutes down the road. If you are looking to get away from the crowds of Destin, this is the place!! A great home for a large family vacation. Very clean, everyone at Beach Reunion is very friendly and responsive to any requests. House was "as adverstised". Our family has vacationed in the Calypso for 2 consecutive years and will not hesitate to book again. Great location 2 blocks off the beach, nice easy walk to beach access. I highly recommend the Calypso. Very good to excellent is how I would rate the service we received. We did have some problem with the Y-FI connection but they came right away with the expert to fix problem. The home and views from third floor Balcone were excellent. The location just a less than five minute walk to the beautifully beach and all amenities were great, like a stand alone ice maker so we would never run out of ice, including pool and spacious side yard made for a good game field. What I like best was the ability to five Familyes in one house with all making this one of the best family reunions ever!!! We had 44 adults and 8 children for a national family reunion in June 2012. Have had reunions in Gatlinburg, Myrtle Beach and Tahoe previously. Rented Calypso and Santorini for the family. Both were perfect in everyway. The Calypso yard became reunion central. From the oldest to the youngest all agreed this was the best reunion yet!!! Your staff was very attentive and helpful when little problems arose. Already planning on coming back, maybe next year. Thank you so much for all you did to make our reunion such a wonderful experience. Highly recommend this house to large groups. All 20 of us enjoyed our week at Calypso. It was spacious, clean and fit our group just fine. The pool was great for our group. We all enjoyed the privacy of the pool and had a great time in it. The one drawback was our chairs w. umbrellas at the beach. They were too far to walk in the sand The beach was beautiful, but I only went to the beach because of the distance to get to our chairs. We loved our stay in the Penthouse. We were in town for a baseball tournament, and shared the unit with another family. Their are two bedrooms on each floor, and the upstairs Master Bedroom are Master Bath are completely private and allowed each family to have its own space. They just put in new flat screen Tvs and the furnishings were top notch. I highly recommend this unit. This is a great home for a large family to spent time together. There is enough space for everybody to have time alone or with the family. The service is very good; if we needed anything the staff was ready and willing to help. We love the location, steps from the beach with beach chairs, and shopping very close all around. 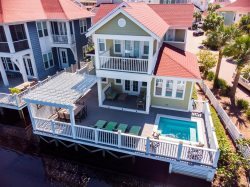 One of the best places to stay in the Destin area. We are looking forward to this summer to spend another great vacation in the Venus. Great place for a large group; Twenty of us celebrated my parents 50th Wedding anniversary. The service was friendly and wonderful, we were allowed in early to leave our luggage while final cleaning was performed. This saved us several hours as we could unload our car and shop for groceries. The home is beautiful; wonderful great room for the family to gather while each couple had privacy in their own suite. All the teenagers and young adults took over the basement area with 3 rooms, plenty of beds,their own refrigerator, pool table and the private swimming pool outside. We were able to easily walk to the beach and enjoyed our private beach spot complete with umbrellas and chairs. Fantastic week and memories that will never be forgotten. Pretty nice place for a large group. The four levels made it so it didnt seem like we were living on top of each other-and we had six families staying there. Pretty easy walk to the beach as well. My only complaint...and its small...is that wear and tear was starting to show in a few areas-doorknobs and handles were getting loose...a few door handles fell off daily, the chairs and umbrellas needed to be replaced, could use some touch up paint. Maybe all that has been fixed by now. But again, very nice, very spacious. Great neighborhood, nice pool, nice furniture inside, plenty of parking for six families. Our family (16 adults, 3 little boys) stayed at the Venus July 7-14 to celebrate my husbands 70th birthday. The house is perfect for a large group, and we had a wonderful time. The pool was a big plus, as were the 2 refrigerators and the separate icemaker in the cabinet on the first level - we never had to worry about having enough ice! The second floor living and dining area was large enough to fit all of us, and it was convenient and easy to spill out onto the porch on that level. The 8 bedrooms were comfortable and it was great having a private bathroom in every bedroom except the lower level bunk bed room, which had a bathroom in the room where the pool table is! The kids didnt care about that - they just loved that cozy room with the bunks! That is also the only bedroom that did not have a television. The showers in the Venus bathrooms were wonderful, all in perfect working order, great water pressure, etc. As for the beach, it was fairly convenient to get to (about a block and a halfs walk) and was so beautiful that the walk was well worth it - this was hands-down the nicest beach and calmest ocean weve encountered in the USa! And finally, as for the service - we met Jim, the BeachReunion agent, when we came by to check out the Venus before moving in, and he was very courteous and put us immediately at ease about the house. I also met Joe, the maintenance man, before we moved in - he said he would be available any time if and when we needed him, and the few times we called him, he was right there to help out (and he never complained!!) Carrie, the concierge, met with us right after we moved into the house and made sure we had everything we needed (i.e., beach towels!!) All in all, it was a wonderful week and we all agreed we had made a great choice in coming to Miramar Beach and staying at the Venus.